Itinerary of Climbing Broad Peak with a Guide. Day 1. Transfer from airport in Islamabad to hotel. Visit to the local Ministry of Tourism in the afternoon, followed by sightseeing tour in the old city of Rawalpindi. Meals and overnight at hotel. Day 2. 11–12 hours ride from Islamabad to Chilas over Karakorum highway (a spectacular engineering wonder that links Pakistan and China). Meals and overnight at hotel. Day 3. 8–9 hours ride from Chilas to Skardu over Karakorum highway running along the Indus River. Meals and overnight at hotel. Day 4. This day of climbing Broad Peak is a rest day spent in Skardu packing food and equipment. Day 5. A jeep ride to Askoli (at 3,000 m altitude) via six villages in Shagar valley (with Askoli being the last settlement on the valley). It is a most spectacular 7–8 hours ride, with crossing the Braldu River several times, and passing by such spectacular spots as hot Sulphur springs in the neighborhood of village Thongal and copper colored stones famous because of local legends about a mythical ruler King Kiser known for his magical powers. Overnight in camp. Day 6. 4–5 hours trek from Thongal to Johla at 3,300 m. The route passes along riverside and on, to the confluence of Bumordo and Biafo rivers, and then crosses (by cable) the River Domordo flowing from glacier Panmah. From that destination you can enjoy panoramic views of Bakhor Das Peak as well as of magnificent Biafo Glacier. Overnight and meals in camp. Day 7. 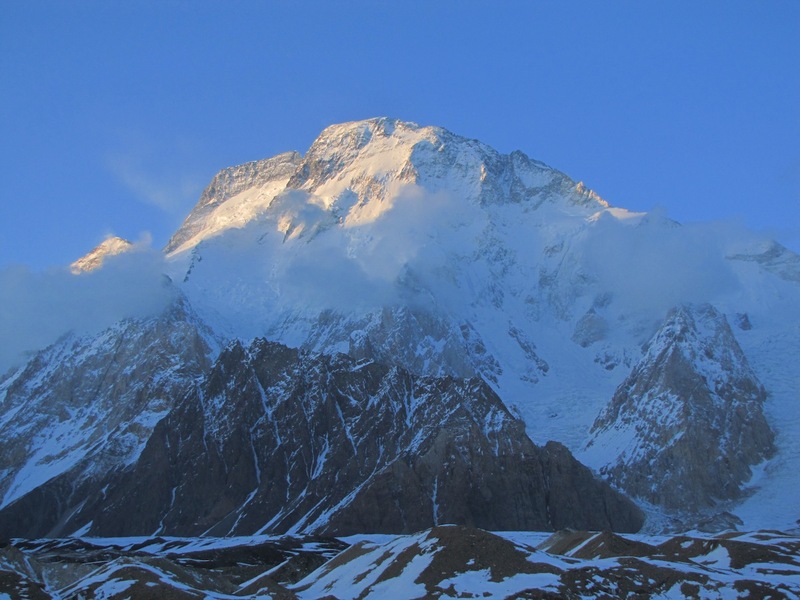 This day of climbing Broad Peak schedule will pass in undulating 5–6 hours walk from Johla to Paiyu (at 3,650 m). The route is difficult at times, which is compensated by the first views of magnificent mountains ahead. We’ll take a break at a stream flowing from Paiyu Peak, by some tamarisk trees. The path leads to a spot, from which we can observe the snout of Baltoro Glacier, magnificent views of the Cathedral Towers in the far distance, as well as the unique triangle of K2. Overnight and meals in camp. Day 8. A rest day at Paiyu spent exploring the neighborhood, with Porter preparing food for the future trek. Overnight and meals in camp. Day 9. 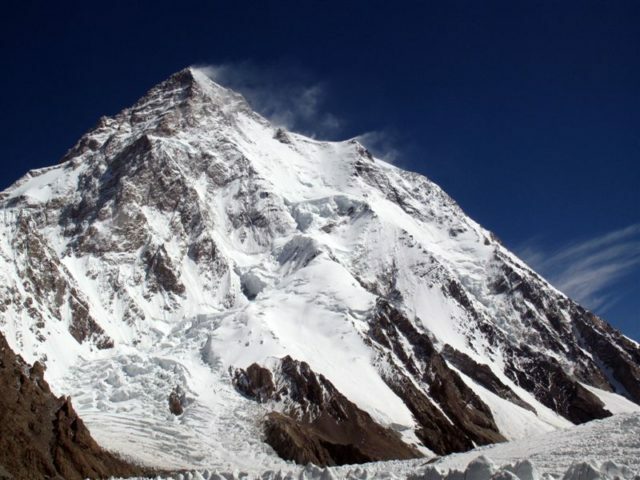 6–7 hours trek to the next destination in climbing Broad Peak schedule, to Urdukas, at the altitude of 4,210 m, a spot named so for the obvious split boulder. Traversing the glacier, the trail angles towards its southeast edge and heads towards the ablation valley at Liligo. Heading out from the glacier in order to avoid outflows from the advancing glacier Liligo, the route is a succession of lateral moraine and glacier. From the camp site at Urdukas you can enjoy incredible views of Paiyu Peak, Uli Biaho, of Great Trango Tower, Lobsang Spire as well as of Cathedral Towers. Overnight and meals in camp. Day 10. 5–6 hours trek to Goro II at the altitude of 4,525 m. From that campsite you can enjoy views of Mt. Masherbrum and Muztagh Tower. Overnight and meals in camp. Day 11. 5–6 hours trek from Goro II to Concordia at 4,700 m with a great chance of enjoying views of 7,000 and 8,000 m peaks like K-2 (Chogori), Broad Peak, G-I, G-II, Sia Kangri, Muztagh Tower, G-IV, Miter Peak and Golden Throne. On the same day after lunch we will continue the trek up to Broad Peak Base Camp. Days 12-41. These 29 days of Broad Peak climbing program will be spent in climbing and summiting activities with overnight and meals in base camp. Day 42. Descent from Broad Peak BC to Concordia, with overnight and meals in camp. Day 43. Full day trek back from Concordia to Ali camp at 4,800 m, with overnight and meals in camp. The first two hours of the trek will be challenging, with the route traversing the Baltoro Glacier and its crevasses. 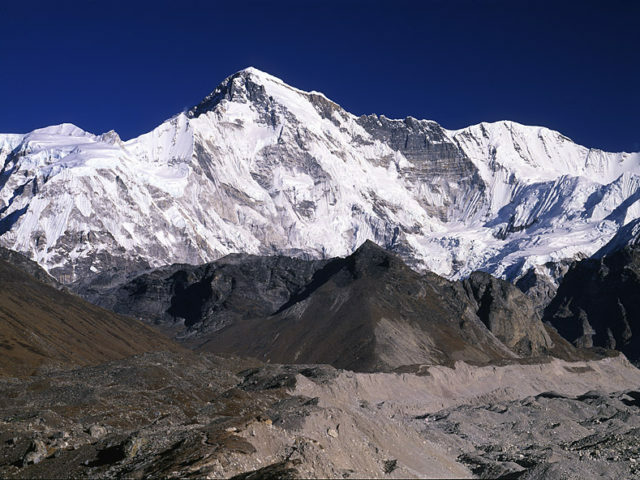 The trek is a comparatively easy and gradual walk over snow and ice, with impressive Chogolisa standing guard in the south. Early sleep, as we have to get up at midnight for trek over Ghondogoro La. Day 44. Trek from Ali Camp to Khursipin after crossing Gondogoro La Pass (at 5,680 m). Leaving the camp at about 1:00 AM to climb the Gondogoro La. The first two hours we’ll walk on lateral moraine in order to avoid crevasses. Getting closer to the Pass, we will shift to snowy route until we get to the base of the Pass. 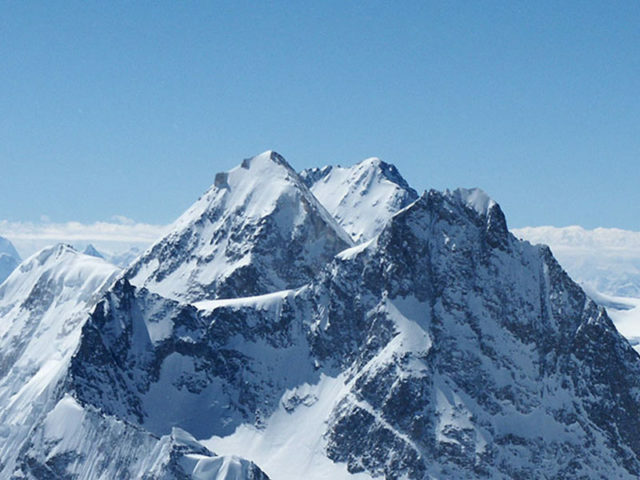 The final ascent consists of a steep walk on snow with the use of fixed ropes (whenever necessary) along with crampons and ice axe. 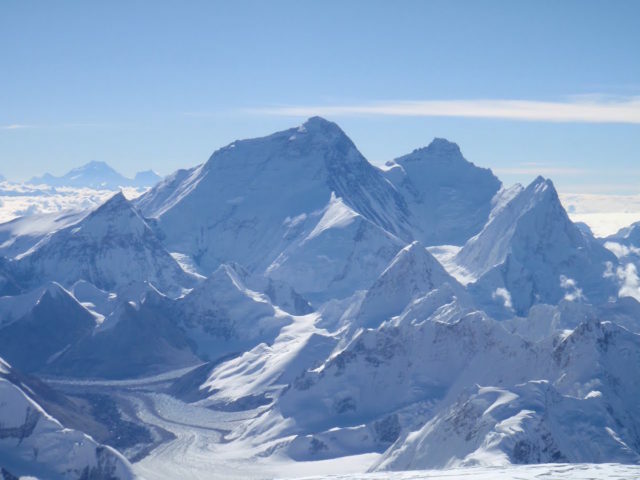 From the top of the pass you can enjoy amazing views with K2, Broad Peak, Gasherbrum I to IV, Masherbrum, and many other mountains appearing at the same level with us. The descent on the Hushe side is steeper, requiring good balance on the rocks. Meals and overnight in camp. Day 45. 5-6 hours trek from Khurspan to Shaitcho via wild roses, Cedar and Tamarish Bushes to Shaitcho. After gradually leaving the icy landscapes we will descend to the meadow and pastureland at Shaitcho (at 3,750 m). At that spot, too, you can enjoy tremendous views of mountains –Namika Peak and Defokhar. Overnight and meals in camp. Day 46. It will be spent trekking to Hushe (3,200 m) along east bank of the river. Hushe Valley runs from Masherbrum Mountains to the South, to the Shyok River, opposite Khaplu. Hushe, the last village up the valley, is about 140 kilometers east of Skardu and is the starting point for treks to various summer pastures up five glaciers. We will descend to the Gondogoro River, enjoying spectacular views of K6, K7 and Link Sar. We will continue to descend, passing through small summer settlement en route to the green irrigated fields at Hushe. Overnight and meals in camp. Day 47. Ride to Skardu passing through many picturesque villages including Khaplu Village, perched on vertical rocks. This cute village of timber-and-stone houses and precision-made dry walls climbs up a wide alluvial fan beneath an arc of sheer granite walls. Meticulous irrigation has made it a shady, fertile oasis. As you climb its twisting track, the icy peaks of the Masherbrum Range rise on the other side of the valley. It’s hard to imagine a more majestic setting near a public road anywhere in Pakistan. The main attractions are the 2,600meter high village itself, the old Royal Place and even older Mosque above it at Chakchun, along with breathtaking views. Overnight and meals at Shangri-La Resort. Day 48. 8–9 hours ride back from Skardu to Chilas by Karakorum highway. Overnight and meals at hotel. Day 49. 11–12 hours ride from Chilas to Islamabad. Overnight at hotel. Day 50. Morning de-briefing with Ministry of Tourism in Islamabad and an afternoon free for shopping. Meals and overnight at hotel. Day 51. Flight back home. Transfers from airport to hotel upon arrival and from hotel to airport on departure. Hotel accommodation with bed and breakfast in Islamabad for four nights. Transportation from Islamabad to Skardu and back to Islamabad with all expedition luggages. Three nights in Skardu – full board (breakfast, lunch, and dinner). Two nights in Chilas at Besham hotel on full board. Wages, insurance, meals of cook. Wages, insurance, meals of asistant cook. Wages, insurance, meals of Porter Sirdar. Porter payment, including low altitude porters. Personal baggage, no more than 50 kg at the beginning of climbing expedition and 35 kg when returning. Full board camp food during climbing Broad Peak treks and at base camp. Mass tent, kitchen tent, tables, chairs and kitchen equipment. Mail delivery at the base camp. Reconfirmation of international flight tickets. Camping fees, road taxes and bridge crossing of expedition members and porters. Briefing and debriefing at the Ministry of Tourism. 1000 US$ guarantee pollution fee. US $ 200 for environment protection fund. Fuel, tarpaulin, food and stove for porters. L.O. insurance, hotel, and transport. The liaison officer’s salary in the city ($ 30) and on mountain ($ 15). Our service is up to the base camp. Climbing equipment, food, and high altitude porters are not included in the price of this trip. Medication, ground evacuation and helicopter rescue deposit US$6000 as well as other charges of any kind. Sleeping bags, backpacks and personal clothing and climbing equipment. Room services, laundry charges, beverages and items of personal nature. Custom clearing and forwarding agent’s charge. Phone and other communication bills. Insurance or liability of any members. Islamabad Hotel Lunch and Dinner. Other expenses and service not mentioned in this list which may occur during climbing Broad Peak.